Hello! I had a chance to play with the final Viva la Verve sketch for January! This is my card for the week 4 challenge (all details here in the Verve Splitcoast forum). I started by embossing the frame from Framed Wishes in black. I used a Spellbinders Long Rectangle Nestabilities die to cut part of the frame (the die was the height that I wanted to cut my frame, but it was too long), then I slid my frame over and cut the other side of the frame. Next, I die cut a circle out of the frame and embossed the sentiment, "May All Your Dreams Come True" (from Always on Mind) directly onto my black mat, then I popped the frame over it. Finally, I added some stitching, dyed seam binding ribbon and a few black flatback pearls from Pizzazz Apenty. Accessories: Long Rectangle and Standard Circle Nestabilities, Fancy Scalloped Butterfly Pierceabilities (Spellbinders); Black pearls (Pizzazz Apenty), Black and White Pearl embossing powder, Seam binding ribbon, Glimmer Mist (Tattered Angels), Rose (Prima), Foam tape, Thread, Sewing machine. Stephanie - this is beautiful. I really like the frame around the verse, and super colours. You've been really busy showing really lovely cards. Love the polka dot paper! What a gorgeous card Stephanie!!! Pretty card Stephanie! 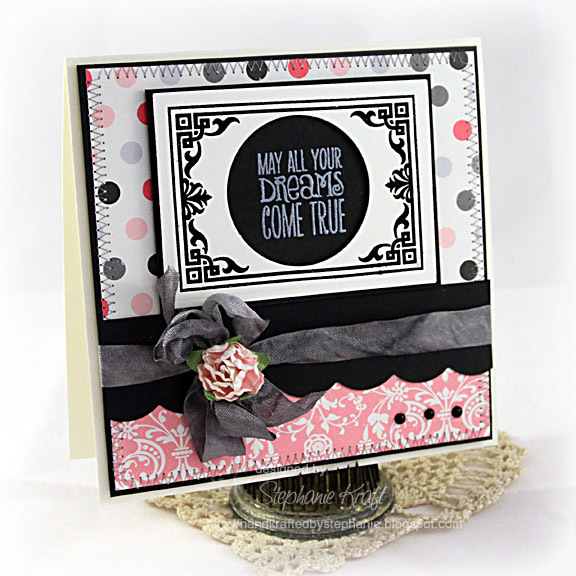 I love the white stamped sentiment on black - really pops! Beautiful bow and flower! Fun Fun polkadots! Fab colors and beautiful card!